Poll: What Subjects Should I Cover on the Quilting Business Website? Poll: What Subjects Interest You Most? OK, now that we have a few suggestions for topics, I wanted to create a poll to see if I can get a sense of what you want to learn on the Quilting Business site. You can choose up to 3 subjects, and if you have any other suggestions, please use the Comments section below to post them. I will review the comments daily to see if it's worth adding any of the suggestions to the poll. I know it's not scientific, but what I'm trying to do now is get a feel for the type of information I should focus on in the beginning. How to choose the right quilting machine and/or other machines. How to come up with a pricing scale. I am not sure on how to price my quilts. Most of what I do is people bringing their quilt tops to mw and they want me to finish them with battin and backing and finish sides I think maybe I am doing these to cheap. I do these quilts on a quilt machine. I am pricing by the job because it’s difficult to figure all things that need to be considered in pricing a repair and especially a restoration. If I priced it by the hour I don’t think I would have any business as it would be really expensive. So is this the right way to do it? Hi to all and to Chuck – Couple of things of interest. One, how to fit a quilting business into my full-time job and make a little extra money; and, two, how to price my quilts and small projects like table runners. It is hard to compete with Walmart, Target, Penney’s, etc., with quilts when you can buy one for $69.95. It costs a lot of time and money to make a quilt of excellence as we all know. So, is there a market out there for pricing a queen quilt at $300, $500 or $750? I would be very interested in knowing. this year. Is there a good way to get it noticed over other sites?? I am very interested in opening my own shop, but there are so many things I have to learn. How do I find out what people are looking for most in a quilt shop? I want to be the shop that covers everyone’s needs. I have small, custom quilt business – making primarily special order quilts. Additionally, I work fulltime at the local hospital. One of the things I’ve done is to donate quilts to local organizations such as the hospital volunteer group for fund raising raffles. This gets my name out to people who are interested in purchasing one of kind custom items. Make certain that the item donated has a clear label and the raffle advertising includes “Custom quilt donated by Gavia Designs”. 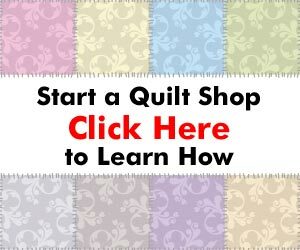 I agree with Lynn May, how to begin a Quilting Business while keeping a full time job! To Get It Done So “What Can I Do? I am retireing soon. It is my dream to make and sale quilts. my question is , How do I get started in the business? Any information you can give will be appreciated. How do I work my website there arent enough of tutorials to do so? Chuck, just wanted to say hi, good to see you back. Hello Everyone, and thanks for the comments, suggestions, and kind words. I was planning on covering a lot of the items you suggested, and you gave me a few more great ideas. I’ll do my best to give you the info you want, and in a timely manner. Also, you may find some of the answers on the site already. Just use the Search box on the right side of this page. Starting next week, I’ll be doing a weekly Q&A article where I pick one to three questions you submit and do my best to answer them. Should be fun, and hopefully informative. Again, thanks for the support, and I hope to make this site as useful as possible. Yes, how do you select the right quilting machine? I have become proficient on the HQ 16 and don’t feel that is the right one to purchase. I’d like to try other machines and look at all the bells and whistles. Where does price break and value of machine cross? Hello Lyn May and Nina – Having a full-time job and starting a part-time quilting business can seem like a daunting task. But, it’s not impossible. This is definitely a question I’ll cover in the very near future, so watch your email. And thanks for the question(s).